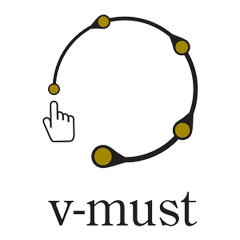 V-MusT.net is a Network of Excellence, funded by the European FP7 Network of Excellence (Grant Agreement 270404), focused on Virtual Museums. It aims to provide the heritage sector with the tools and support to develop Virtual Museums that are educational, enjoyable, long-lasting and easy to maintain. V-MusT.net, coordinated by CNR, is participated by 18 partners, coming from 13 different Countries and more than 100 Associated Members. The project is developed in 4 years (1st of February 2011 - 31st of January 2015). Virtual Museums are a new model of communication that aims at creating a personalized, immersive, interactive way to enhance our understanding of the world around us. The term Virtual Museum is a short-cut that comprehends various types of digital creations. V-MusT.net will bridge technological domains, archival, social and cognitive sciences to advance the state-of-the-art of digital preservation, for Virtual Museums future persistence. It will finally create a virtual research area; identify researches for further development; identify the VM of the Future; increase competitiveness of the EU-ICT industry; create a quality evaluation procedure.